Recognised as Australasia’s Leading Meetings and Conference Centre from 2012 - 2015 by the prestigious World Travel Awards, the Melbourne Convention and Exhibition Centre is a one-stop-shop for creating and running a successful event. This includes amazing spaces, leading technology, creative food and wine, and staff with the skills and experience to bring it all together. 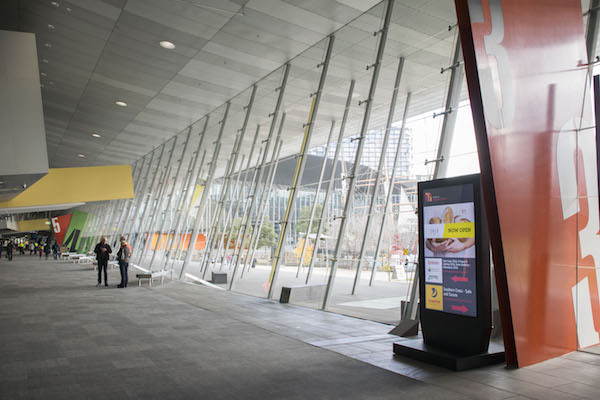 Entrances to the multiple convention and exhibition spaces branch off a long foyer lined with modern architecture and angled windows looking out to the Yarra River. Because of MCEC’s size and scope, there are often several events taking place within the venue at any given time. This means the long corridor is frequented by several people, each seeking their specific event of interest. 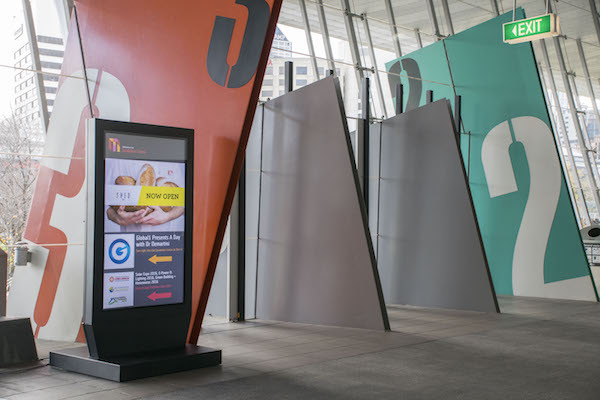 Paul Rumble, Senior Manager Technology Services at MCEC, chose to integrate digital signage options to help direct foot traffic through the exhibition and convention halls’ shared foyer. The shared foyer is pretty expansive — the kind of space that’d instantly dwarf a petite screen. Here, digital signage has to be big to make an impression. So they went big. 80 inches big. "the Gilkon shroud is designed to lend digital signage a commanding presence as well as structural stability"
MCEC purchased two colossal 80-inch NEC commercial panels. To accompany them, Rumble approached Gilkon to construct custom enclosures (or shrouds) for both displays, having first seen Gilkon’s offerings at the Integrate 2015 expo. Like a well-matched photo frame, the Gilkon monolith is designed to lend digital signage a commanding presence as well as structural stability. MCEC purchased two of them to house the NEC panels, both of which stand tall and proud in the entranceways of MCEC. It’s not just the aesthetics that makes the giant enclosure what it is. Portability was a key requirement for MCEC’s needs — something Gilkon’s shrouds hadn’t featured previously. Though it posed a challenge making such a sizeable rig relocatable with anything less than a forklift, Gilkon built castors into the shroud that allow them to be easily and strategically placed wherever the most foot traffic will be concentrated. Power and Ethernet connections appear at spaced outlets all along the foyer to avoid long and ugly cable runs. Content is controlled centrally from MCEC’s digital signage software. Adding portability wasn’t the only first for Gilkon. These were also the largest shrouds the company had made, with the next size down being 70-inch.